Tanya Manning-Yarde, Ph.D., is a poet and freelance writer from New York City. A graduate of Rutgers University and University at Albany, she recently worked as a copy editor and contributing writer for Bronze Magazine. She blogs at tanyamanningyardephd.wordpress.com (Instagram @every_watering_word_author) and is a freelance blogger for the annual Montclair Film Festival in Montclair, NJ. Prior to pursuing a career as a writer, she was a high school English/Language Arts teacher, Assistant Professor, Instructional Coach, and an educational consultant. Her poems have been published at Literary Mama, Memoryhouse and Random Sample Review. Her first poetry collection, Every Watering Word, was published in 2017 (Wasteland Press). 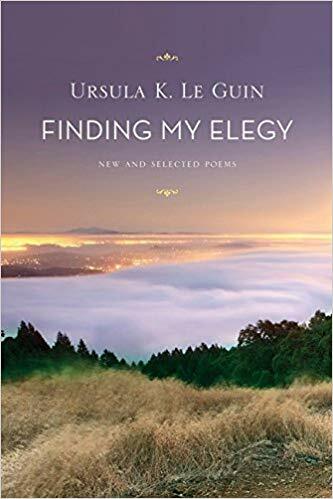 Finding my Elegy: New and Selected Poems (Houghton Mifflin Harcourt, 2012), by Ursula K. Le Guin, is a compelling constellation of poems. Spanning fifty years, this collection chronicles selected early writings to contemporary pieces previously unpublished. Although well known for her science fiction writing, Le Guin was also a prolific poet, demonstrating versatility in verse and dexterity in the topics she pondered. This compilation illustrates Le Guin’s agility; her poetry is unfettered, unobligated, reliant neither on topical boundaries nor compliant with poetic structural apparatuses. Throughout several of Le Guin’s poems is an attentiveness to contrast in which she details observations of an object, concept or location and compares it to something else. In one poem titled “Writers,” Le Guin makes a stark comparison between visual artists and writers, between the art that is physically and sensorially rendered by sculptors and musicians to the revelatory unfolding that writers make readers do. It is this unfolding by the reader that Le Guin contends is the art of a writer. Le Guin discusses the creating and delivering of written art as not occurring exclusively in the artist’s hands but as transactional; the unraveling and excavation of meaning occurs between writer and reader (“A writer’s work /is with the insubstantial word /the image that can only find /its being in another’s mind”). Writer and reader are collaborative cartographers. Le Guin also demonstrates dexterity and alacrity in designing interpretive lenses for readers to use in entering her poems. Several of her pieces situate readers as sociologists accompanying her in examination of how nature and humans live and interact within a shared world. In one such poem, “April in San Jose,” Le Guin employs contrasting images of floral aesthetics and abject humanity, illustrating through contrast the experiential disparity between nature and man. Sensory laden descriptions of natural beauty present the experience of nature as abundant and self-affirming (“sweetness of freesias, garlands, wreaths,” “dark fragrance of eucalyptus,” and “glitter and rustle of inordinate palms”). Alongside such images are ones captured of men in conflict, downtrodden and deflated. In contrast to their thriving, colorful and natural counterparts, these men simply endure their existence (“bark wordless pain like dogs, /roar rage in one dark syllable, /or stand and beat an oak tree with their fists”). It is suggested here that the disparate descriptions are assembled by Le Guin to make the case for the reader that the experience of life itself is not absolute. More to the point, she juxtaposes many aspects of an urban setting to make the case for the reader how dissimilar phenomena can, paradoxically, co-exist and co-mingle (“in the valley of ghosts and orchards”). Le Guin provides a litany of natural locations, distances and natural artifacts to punctuate the lengths the narrator will go for his/her voice to be aligned with an original calling, an ethereal language. These descriptions of natural settings serve as markers along a larger journey, both physical and metaphoric. Le Guin is astute in writing poetry in service to providing social commentary on phenomena characteristic of the human experience, spanning personal experiences such as parenting to collective experiences such as war. Conflict and war particularly are topics that permeate several of Le Guin’s poems. In “The Curse of the Prophetess,” centered on the conflict in the Middle East between Israel and Palestine, Le Guin creates a litany composed of invocations condemning irreverent behaviors humans show one another, and later, a hope for the restoration of recognition by those involved of one another’s humanity. In “Soldiers,” she creates a space to illustrate the facets of war and its impact on both soldier and society, contrasting images of fallen soldiers and enthusiastic crowds, patriotic celebration and protests of fatalities, in service to a larger question regarding what is gained and lost in war. Ursula Le Guin has left a legacy of writing that will require many lifetimes to digest. Dexterous and nimble in free verse and quatrain, agile in use of meter and rhyme, willful in refusing to align with any one form of writing, Le Guin evinces possibilities wildly imagined. Thank you, Tanya, for this thought-provoking post. Looking for an instant Le Guin poetry fix? A few of her poems have been published online here. This entry was posted in Poetry, Witch Week and tagged Tanya Manning-Yarde, Ursula K Le Guin. Bookmark the permalink. Beautiful appreciation of a lesser-known side of Le Guin. Her novels certainly evince a poetic sensibility, which is one of the things I love about them. Thank you, Lory. Chris and I couldn’t have a week dedicated to UKLG without including a look at her poetry. I agree with you, Lory, that UKLG’s novels have a poetic sensibility, it’s most evident in the Earthsea series (which naturally is strongest in my mind) but I have been aware of it too in some of her SF pieces. I have one of her contemporary novels waiting and I’ll be expecting to encounter it there too, set as it is on the Oregon coast she was so familiar with. It’s a bit like discovering a brand new author — I’m certainly adding at least one of Le Guin’s poetry collections to my reading list. Further, “The evening will begin and end with readings of two of Le Guin’s poems by local Cardiff poet Christie Collins—one from Le Guin’s first collection of poems, ‘Wild Angels’, and one from her last collection, ‘So Far So Good’, completed shortly before her death.” I hope to give a report on all this after the event. Sounds perfect. This week the documentary “The Worlds of UKLG” opens here in NYC, and I might squeeze in a trip downtown to see it. Synchronicity! Thank you! I was unfamiliar with LeGuin’s poetry until recently. Her text structures and topical explorations offer much food for thought. I’m glad, then, Tanya, that we introduced you to her work. I hope you’ll read some of her novels as well — her poetic style spills over into her prose.